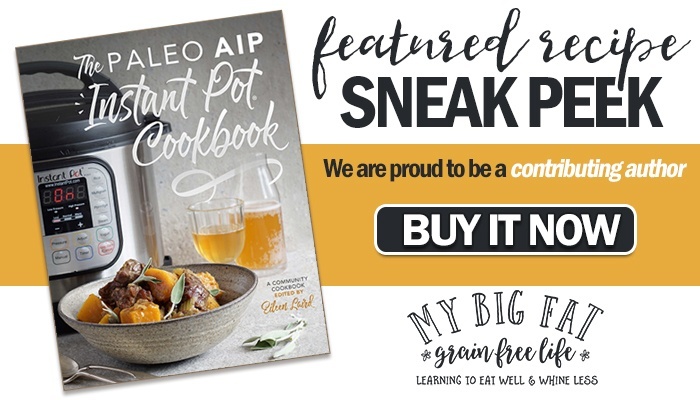 I am SO EXCITED about The Paleo AIP Instant Pot Cookbook. As a contributing author, I was given the opportunity to peruse the entire book and I am being totally honest with you when I say I was blown away. I kept saying “Oh! I can’t wait to make that recipe.” over and over and over. I have to admit to you that I’m a bit of a cookbook hoarder. 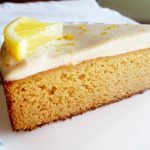 I love cookbooks (both in print and ebook format) but sometimes I’m disappointed that they contain only a few recipes that I would actually make. THIS cookbook is different. 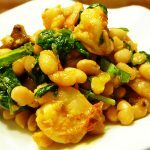 The ingredients are easy to obtain and the meals are weeknight-friendly creations that look delicious. 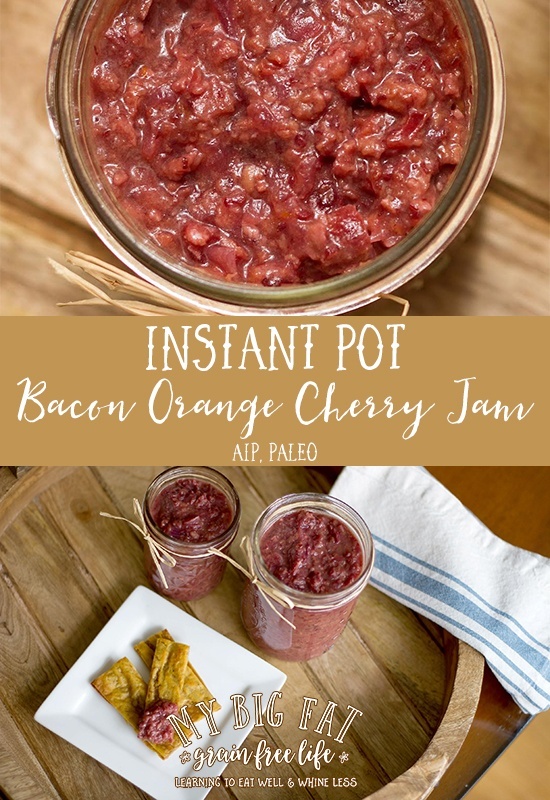 The recipe I am sharing with you now is one of my contributions and a sneak peek of what you will find in The Paleo AIP Instant Pot Cookbook. 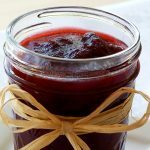 Bacon Orange Cherry Jam is an easy condiment to make and it pairs well with just about any protein. 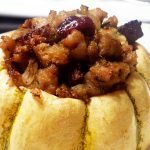 Serve alongside fish or burgers, stuffed under the skin of a chicken or turkey, or inside a center-cut pork chop, or even use as a topping for AIP pizza crust. Stay tuned – because I will be posting recipes very soon featuring this Bacon Orange Cherry Jam. To make this jam SCD and GAPS compliant, substitute honey for the maple syrup. 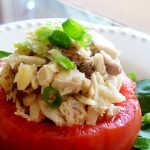 This is one of over 140 recipes in The Paleo AIP Instant Pot Cookbook. Shared on Allergy Free Thursday. Press the saute button on the Instant Pot. When hot, add bacon and stir occasionally to crisp evenly. One crisp, remove to paper towel-lined plate and set aside. Remove all but about 2 tablespoons of the bacon grease and discard or set aside for later use. Add onion and saute until soft. Add garlic and stir until fragrant, about 30 seconds. Add the cooked bacon, cherries, applesauce, maple syrup, orange zest, and orange juice. Stir well. Cancel the saute function. Close and lock the lid. Press “manual” for high pressure. Set cooking time to 6 minutes. Once the time is up, quick release the pressure (using the instructions on page 7). Press the saute button again and allow mixture to boil, stirring frequently to prevent burning. Reduce the liquid until thickened to a little less than 4 cups. Cancel the saute function. Allow mixture to cool slightly, then use an immersion blender or high-speed blender to puree mixture until pureed but still chunky. 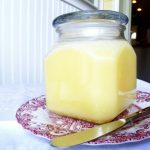 Spoon into clean glass jars and allow to cool completely. Once cooled, cap the jars and refrigerate. Will keep at least one week refrigerated. I have a few questions…first, can this be frozen so it will keep longer? Can dried onion be substituted for the raw onion (I really dislike all raw onion but will use minced or powdered onion in cooking at times). If onion is omitted can I increase the garlic and still get a good result? I LOVE garlic. 🙂 Do you think it’s better tasting with the maple syrup or the honey? Finally, is this really good as a dip or spread, or is it better in the recipes (like as a stuffing for pork or chicken)? Thanks so much in advance for your help! Hey Sandra – This recipe does freeze really well. Just thaw in the refrigerator overnight and it should be ready to use the next day. I freeze it in glass pint jars. Your other questions are tough to answer as I haven’t made any of the substitutions myself. The onion helps with the consistency of the jam, so I would be hesitant to replace it with garlic or dried onion. As for maple syrup or honey, it’s completely a personal preference. If you substitute honey, I would try a mild variety. I think this jam is good in many ways. 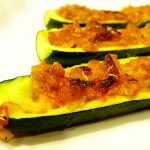 I like it as a dip or spread, but have used it more often to stuff under chicken skin or inside a pork loin. I’ve also used it as a pizza sauce and then topped with chicken to bake and then fresh cilantro after baking. It would be delicious under a turkey breast skin too – that’s next on my list to try. If you don’t have an issue with dairy, it would be really good with a cheese like brie, or even cream cheese. Hope that helps. 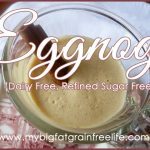 Can you cook this completely on stove top with out instant pot??? Yes – I’m sure you can. Just watch it and reduce it down.